The topic may be controversial but the content is fascinating and thought provoking. . . . This riveting and intelligent study has relevance to a wide audience of biblical scholars. Today's Librarian. Rated “Must Read.” - Today's Books. It’s a riveting read that’s definitely not for the biblically faint of heart. - Florence, SC News. 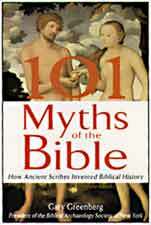 101 Myths of the Bible examines many of the most famous stories in the Old Testament and shows the various influences that led to the writing. Among the subjects explored are the earlier versions of many biblical stories that were told among Israel's neighbors, the strong Egyptian influences on many of the biblical accounts, and the internal political and religious feuds in ancient Israel that led to various propagandistic versions of earlier history. ● The story of Esther originally had nothing to do with the Jews of Persia. This book will probably either strengthen your faith or cast it into doubt. Just remember, there’s a reason its called faith. At any rate, it will make for lively dinner table discussions. - Spokesman Review. In this controversial new book, author Gary Greenberg offers insight into the meaning, origin and accuracy of stories from the Old Testament. - Jewish Transcript. Greenberg has obviously used considerable research to find myths and legends that could parallel biblical episodes . . . some of his comparisons create interesting reading. - The Aniston Star. Recommended for larger religious collections. - Library Journal.